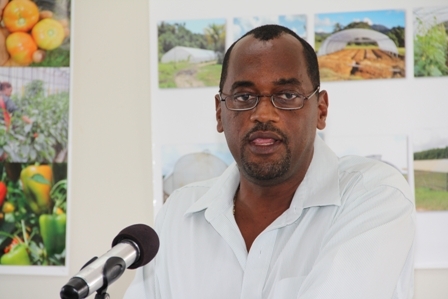 NIA-CHARLESTOWN NEVIS (June 02, 2011) — Permanent Secretary in the Ministry of Agriculture on Nevis Dr. Kelvin Daly announced Thursday the intention to expand the cold storage facility at the Marketing Unit, once reconstruction work of the Charlestown Public Market is completed. He made known the plan, when he delivered remarks at a symbolic ceremony to hand over a cheque to the New River Farmers Cooperative from Head of the Inter-American Institute for Cooperation on Agriculture (IICA) St. Kitts and Nevis Mr. Augustine Merchant, on behalf of the Australian High Commission based in Trinidad. The US$11,600 cheque will be used to purchase a cold storage walk in freezer for the farmers. Dr. Daly said limited storage capacity in particular refrigerated storage was among the major issues which faced agriculture. “This problem is particularly acute during this time of year when daytime temperatures soar and the nights are incrementally cooler. This problem is discussed at Caribbean Community (CARICOM)/Council for Trade and Economic Development (COTED) meetings and is easily recognised as the most significant post harvest problem that is draining the wealth away from our farmers and our economy. “It is indeed dispiriting for farmers who after months of battling insects, monkeys, thieves and bad weather, to be finally broken by the inadequacy of cold storage. This is a nightmare scenario not only for our farmers but for us in the ministry of Agriculture,” he said. Notwithstanding, the Permanent Secretary reminded those present that the Ministry continued to work steadily to improve its capacity at the marketing Division and in 2008 the capacity was doubled from 800 feet to 1600 ft and in 2009 a 40 foot refrigerated container was added. He acknowledge it was the Ministry who had driven farmers to produce more food in an effort to meet the goal of food nutrition and security and therefore they would continue to assist to alleviate the threat posed by limited cold storage. Meantime, Dr. Daly described the ceremony as one which demonstrated that the Nevis Island Administration did not always have to take the lead in moving the process forward. “In less than one year after discussions were held with the executives of the New River Farmers Cooperative, we are here to witness and to celebrate this achievement. “I must applaud their President Mr. Marcel Hanley for showing the type of leadership required to change the dynamic from subsistence to wealth creation. He could have gone the way of others by selecting from the multiplicity of farm inputs that in the end would have done little to resolve this inherent weakness in the supply chain,” he said. The Agriculture Official also had high praise for Mr. Merchant who he described as a great advocate for Nevisian farmers. He applauded his contribution to the New River Farmers Cooperative and other contributions in agriculture before and for those to come.